M66 is a barred spiral galaxy in Leo. 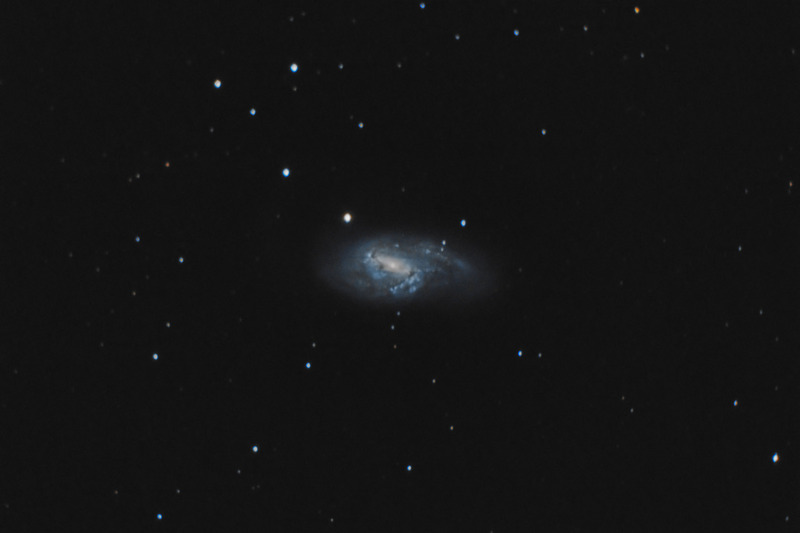 This galaxy is one of the 3 galaxies making up the "Leo Triplet" of M65, M66, and NGC 3628. The high concentration of stars in the center of the galaxy may be a result of the gravational interaction with its two neighbors. This galaxy has apparent dimensions of 9' x 4'. In this photo, North is to the Left. This image is cropped to 52% of the original full frame. Software Used Images Plus 4.0 for camera control, calibration, stacking, digital development, multiresolution sharpening, smoothing and noise reduction. Photoshop CS5 used for levels and curves, color correction, selective color, high pass filter, star shrinking, saturation adjustments, and screen mask invert. Gradient Xterminator for gradient removal. Carboni Tools for additional saturation adjustments, noise reduction, and smoothing. HLVG for additional color correction.